Number 30 Old Burlington Street is located in London’s West End, in the heart of the fashion and arts district of Mayfair, close to Bond Street. The new development will consist of 42 luxury apartments with boutique-hotel-style amenities, together with art gallery spaces on the lower ground and ground floors and part of the first floor. Frame contractor JP Dunn installed approximately 160 sheet piles to a depth of 14 metres around the perimeter footprint of this eight-storey building, which has a three-storey-deep basement. During the piling and pre-auger process, the engineers believed that, due to the hard clay substrata, the holes did not backfill as expected and that voids may be present. This raised concerns over future ground settlement and movement, not only for the new structure but also for the adjacent buildings that are Grade 1 listed and of significant historical interest. 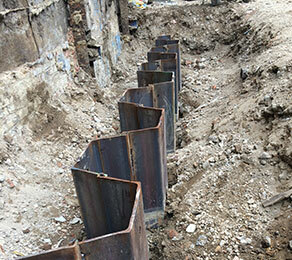 CCL devised a bespoke but simple and cost effective system for grouting the voids. A 14-metre grout tremie (made up from 4x3.25 mm Ø) was inserted. A Portland cement grout was then injected until refusal or until a maximum quantity of 940 litres was reached. Despite the hardness of the ground, restricted access and extremely limited space for any plant, CCL was able to ensure the voids were grouted to the satisfaction of the engineer.